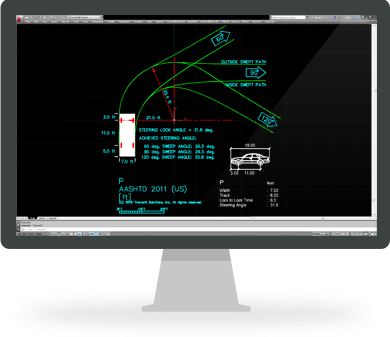 Try Vehicle Turning Templates for free today. Electronic vehicle turning templates are an affordable solution for elementary roadway and site design projects and work in virtually any CAD platform environment. This demo is a fully functioning program. Please note that a few elements have been modified and some functionality has been limited. However, the demo should provide you with a good representation of what the software can do and how it can be applied. The demo should not be used in actual design or project work.